TA-65 is a dietary supplement and is suitable for people over 30 years. TA-65 is on the market since 2009. Already thousands of users and hundreds of doctors recommend TA-65 for daily consumption and are happy with their choice. TA-65 is the main topic of different conferences about age management and numerous publications. 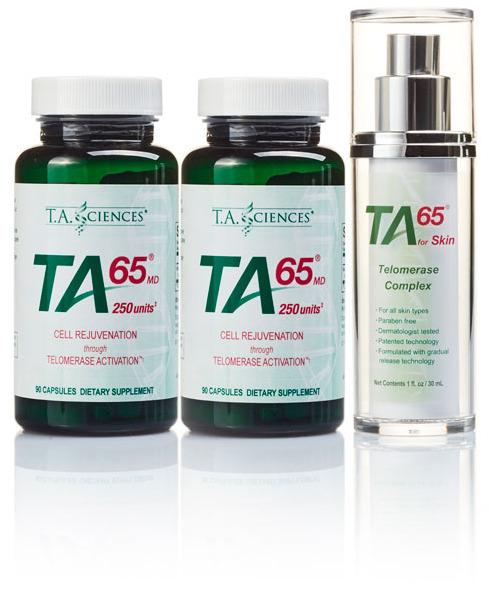 TA-65 is scientifically proven to activate telomerase and to lengthen the telomeres. The following diseases and conditions have been found to shorten telomeres: hypertension, myocardial infarction, stroke, osteoarthritis, rheumatoid arthritis, cancer, acquired aplastic anemia, dyskeratosis congenita and pulmonary fibrosis. TA-65 helps athletes improve their sports performance. However, TA-65 is a dietary supplement and not a drug. Thus, it does not prevent diseases. It activates telomerase, which helps cells to function normally and be healthy. Let your doctor or health coach know about the telomere biology and ask if TA-65 is suitable for you or contact our medical specialists for free advice. TA-65 is a molecule which is extracted from the plant Astragalus. It is the only substance so far to be scientifically proven to extend the telomeres’ length. But why is this so important? Telomeres is the name of the ends of the chromosomes. A chromosome is a DNA-spiral which is located in the cell nucleus, and it contains genetic information. When a cell divides, the information of the mother cell is passed on to the two daughter cells. Cell division can not continue forever. Every time a cell divides, the telomeres shorten. When the telomeres become too short the cell cannot be divided – it dies off. With cells dying, the aging process goes on. Telomeres are responsible for protecting the chromosomes. They can easily be compared to the protective ends at the ends of shoelaces. Telomerase ensures that the the telomeres get longer instead of shorter. This allows the cell division to go on much longer. The length of the telomeres can be studied in tests. Thus, one can determine how their actual, biological age differs from their chronological age. If one takes TA-65, the test may be repeated and a difference can already be noticed in the length of the telomeres. This is the result of years of scientific research that telomerase lengthens telemores and has received adequate appreciation in 2009 with the presentation of four Nobel Prizes for Medicine in that year. On this website you can easily order the products of TA-65. So you can protect your telomeres. You owe it to your body to take good care of yourself.